A root canal is a treatment used to repair and save a tooth that is badly decayed or becomes infected. During a root canal procedure, the nerve and pulp are removed and the inside of the tooth is cleaned and sealed. Without treatment, the tissue surrounding the tooth will become infected and abscesses may form. It is the term used to describe the natural cavity within the centre of the tooth. The pulp or pulp chamber is the soft area within the root canal. The tooth’s nerve lies within the root canal. Drainage problems extending outward from the root. 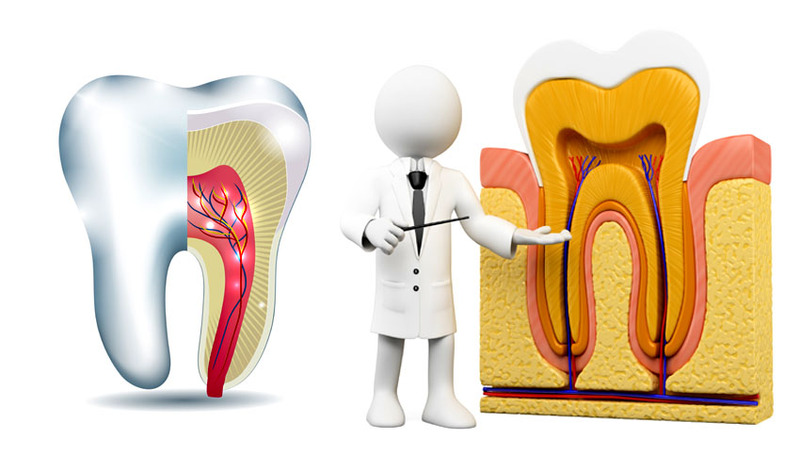 A tooth’s nerve and pulp can become irritated, inflamed, and infected due to deep decay, repeated dental procedures on a tooth, and or large fillings, a crack or chip in the tooth, or trauma to the face. The first procedure is to take an X-ray to see the shape of the root canals and determine if there are any signs of infection in a surrounding bone. The area is numbed by anaesthesia near the tooth. To keep the area dry and free of saliva during treatment, a dentist will place a rubber dam around the tooth. An access hole will then be drilled into the tooth. The pulp along with bacteria, the decayed nerve tissue, and related debris is removed from the tooth. The cleaning out process is accomplished using canal files. A series of these files of increasing diameter are each subsequently placed into the access hole and worked down the full length of the tooth to scrape and scrub the sides of the root canals. Water or sodium hypochlorite is used periodically to flush away the debris. Once the tooth is thoroughly cleaned, it is sealed. If the root canal is not completed on the same day, a temporary filling is placed in the exterior hole in the tooth to keep out contaminants like saliva and food between appointments. The second time, to fill the interior of the tooth, a sealer paste and a rubber compound called gutta percha is placed into the tooth’s root canal. To fill the exterior access hole created at the beginning of treatment, a filling is placed. The final step may involve further restoration of the tooth. because a tooth that needs a root canal often is one that has a large filling or extensive decay or other weakness, a crown, crown and post, or other restoration often needs to be placed on the tooth to protect it, prevent it from breaking, and restore it to full function. After the completion of the root canal, the tooth may feel sensitive due to natural tissue inflammation, especially if there was pain or infection before the procedure. Following good oral hygiene practices may reduce the need for a root canal procedure. Trauma resulting from a sports-related injury can be reduced by wearing a mouth guard.